This was an interesting concept from the outset – I’ve never come across a re-fermentation process using Champagne yeast before. I guess I was expecting some strange liquid gold alchemy with a buttery bubble melting sensation on the tongue – however this was not the case! The result from pouring, was a good clean yellow beer with decent white frothy head – typical of a quality continental lager. The taste was OK – sweet honey notes, grassy, and vibrant with mild IPA qualities (including citrusy aromas) – finished with a crisp and refreshing carbonation. Essentially it tasted like a very drinkable quality lager – but there was no evidence that the re-fermentation or champagne yeast had given it a uniqueness in flavour – just in the brewing process. 20th July 2012 – Award winning English winemaker curiously now also brews the World’s best lager! The International Beer Challenge which has been judging the World’s best beer’s for the past 16 years – has awarded Chapel Down a Gold Medal for it’s Curious Brew premium lager. The beer maker’s Oscar’s are entered into by the World’s largest breweries, all the way through to tiny pioneering micro-brewers. This year judges tasted over 400 beers before declaring our lager to be worthy of it’s gold medal. The Challenge deemed only 30 beers from around the World to be of Gold Medal standard. We believe that our success comes down to using only the best quality products, and crucially, bringing winemaking thinking to the brewing process. 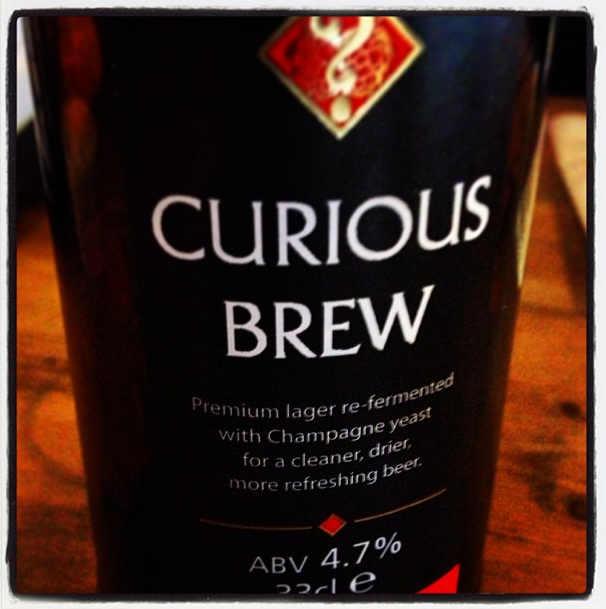 Our Curious Brew is a truly premium lager beer. Brewed in England with precision and passion to create a uniquely satisfying, drier, cleaner, fresher, lager beer. We use East Anglian malt, saaz and cascade hops, then re-ferment using Champagne yeast before adding a “dosage” of the rare and fragrant Nelson Sauvin hop, before cold filtering this unpasturised beer into bottle. ABV 4.7% 33cl bottle – Single Bottle Price £1.75.